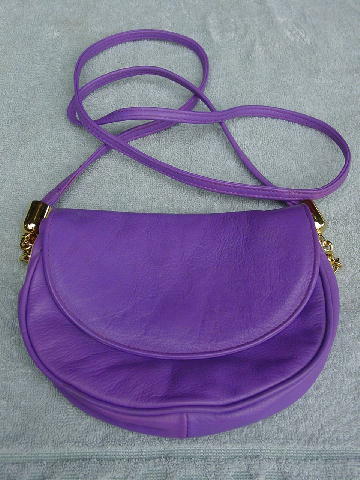 This medium orchid leather purse is lined in black vinyl and was made in Italy for Bloomingdale's. It has a rounded envelope front flap with a magnetic closure. The 47" long leather shoulder strap is attached to a gold-tone link chain and cap holder and goes through a gold-tone circle on each side of the purse. It's from a British model who needed some extra cash.